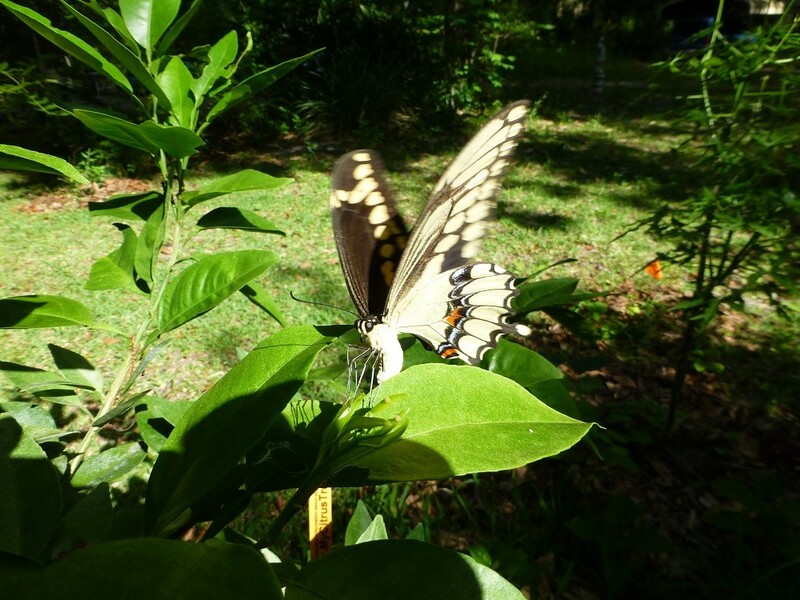 The giant swallowtail, Papilio cresphontes, is Florida’s largest butterfly. The yellow spots on its black wings and its high flying habit make the giant stand out from our other butterflies. There is no problem attracting these guys if you have citrus trees growing because they use plants in the citrus family as their larval food. They are strong & fast fliers and prefer to stay in the tree tops. 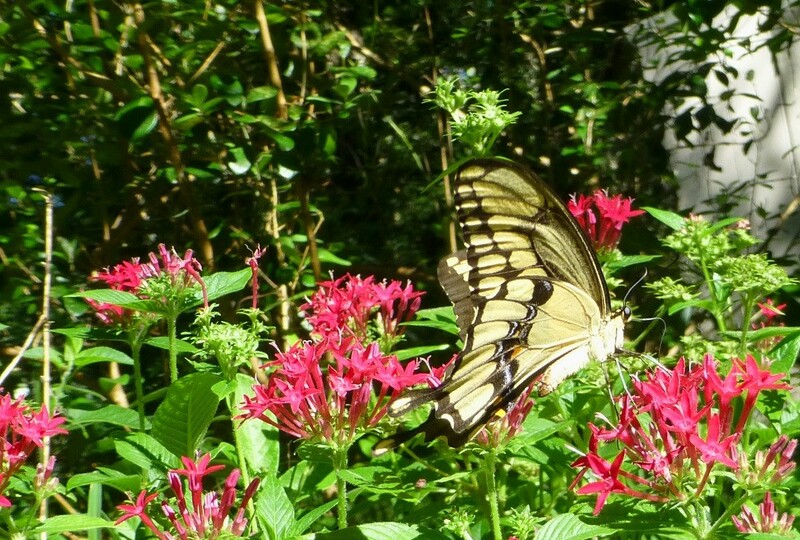 The adult giant swallowtail is quite a sight to see visiting your garden. 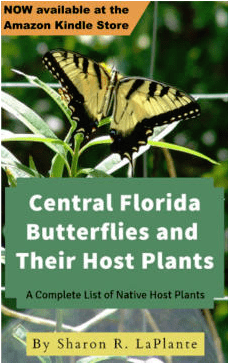 They are the largest butterfly in Florida with a wingspan of about 4-1/2 inches. Generally when one gets a close enough look, the butterfly is concentrating on food or laying eggs and seems to be floating along without a care in the world. However, they are strong and fast fliers and will take off for the tree tops once they lose patience with their human admirers. Their inside wings are a very dark brown banded with yellow bands. On the tip of the inside fore wing the yellow bands cross creating an x like marking. Their outer wings are yellow with blue and orange dots on the hind wings. Their tails are quite long and tear drop shaped with a yellow dot. Their body is yellow with a black stripe running along their backs from head to tail. The giant swallowtail caterpillar resembles a bird dropping. It is splotchy olive brown with patches of dirty white. 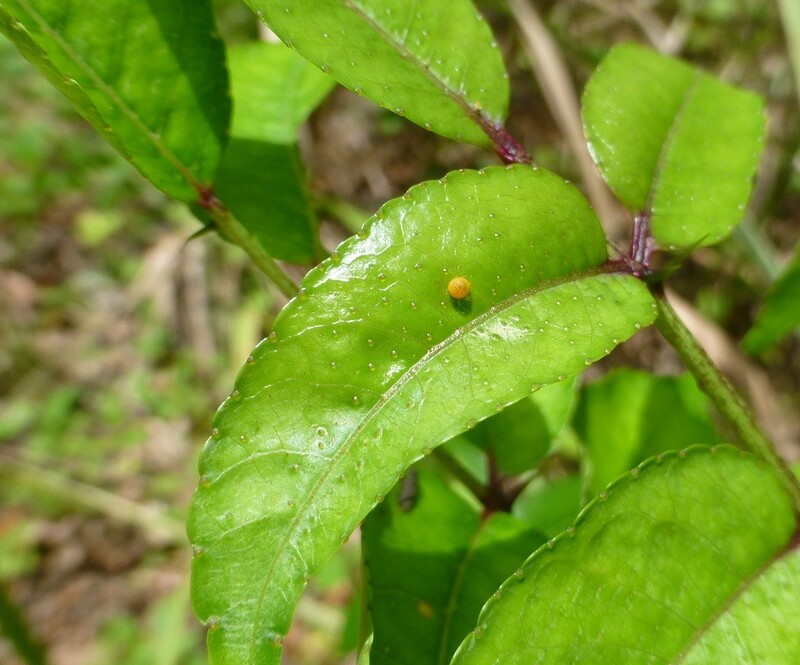 Young larva have a sheen to them that mimics a bird dropping even more so than the later instars. Once they go through several instars and grow to their full length of 2 3/8 inch they lose their shine. When disturbed they produce a pair of red horns (osmeterium) from their head to scare away predators. When the osmeterium are extended they emit a foul odor. The pupa, or chrysalis, is mottled brown and about 1 5/8 inches in length. It is attached to a tree branch by a harness thread about a fourth of the way down the length. They generally appear to be part of the branch to which they attach themselves. Giant swallowtails travel in between woodlands, open areas, and gardens, in search of nectar and host plants. They inhabit forest edges, citrus groves and fields. In Central Florida they are seen from February to November. In the butterfly garden they prefer larger flowers that provide a nice platform for them to rest on giving their wings a brief rest while they drink nectar. They love pentas, Mexican sunflower and ixora among others. However, they can’t seem to resist Spanish needle flowers even though they have to hover all the while.